Are you an avid online shopper? Are you always looking for a freebie? There are plenty of sites online that offer you wonderful prizes for filling out offers or other mundane tasks but the majority of them are either fraudulent or impossible to profit from. As a freelance writer I spend the majority of my day and sometimes night on my computer, so when I find a great site I think others can benefit from; I love to share it. If you haven’t heard of Swag Bucks yet, it’s definitely worth your time to check it out. Swag Bucks is basically an online incentive program where you earn points daily that you can accumulate and turn into prizes. 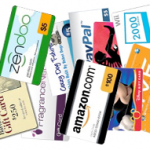 The site offers everything from electronics to trinkets but their main pull is the Amazon and Paypal giftcards. The great thing about Swag Bucks is that it has something for everyone. The easiest way to earn is to download their very useful toolbar which has a nifty little search bar in it. Instead of using big search engines like Google or Bing! try the Swag Bucks search. It’s powered by Google and every time you use it their is a chance to win points. There are however many other more lucrative amounts of points to be earned filling out surveys and free offers. Unlike other sites of this variety they don’t REQUIRE you to purchase a thing BUT there are some really great offers on the site that will reward you if you make purchases. If you do a lot of online shopping, you may find great deals on things you would have purchased anyway! If you haven’t tried the site yet I really encourage you to go ahead and sign up, pronto. The first week I was there I earned more than 1,000 pts without spending a dime and they translated in 2-3 gift cards for me. Are you interested? Click HERE to get started swaggin’ today. *Note To Reader: I am just an independent user. I do not work for or with SwagBucks.com for any promotional purposes. I simply enjoy this site and would love to pass it along to others!